It's finally happened. Not quite as we thought it would, perhaps, but Apple has jumped head-first into augmented reality. And you know what? It's pretty damn neat. Right now AR is approximately 70% hype, 20% Pokémon Go, and 10% actual headsets we can buy – although most of those are made for the workplace (snore). Some people are doing really cool stuff, like Google's Tango, which I recently said I thought had more potential than Daydream. Apple has now steamrolled in with ARKit for iOS 11, a toolbox for developers to build augmented reality apps, which will be available in the autumn. After being taken through a short demo, I'm impressed with what I've seen. 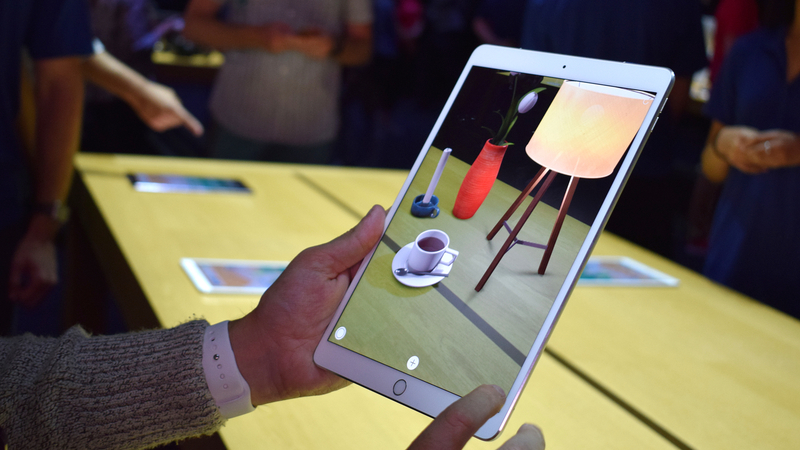 ARKit makes use of the iPhone and iPad cameras along with motion sensing to place virtual objects into the real world. You may have tried something like it before, but while Apple's AR isn't necessarily doing anything revolutionary in this space (yet), it's the quality of the AR that caught me by surprise. I'll explain. In the first demo I could hold up the iPad and place objects on the table in front of me – a vase, a coffee cup, a lamp – and drag them around. Again, hardly pushing the boat out here, but each object manifested in front of me with remarkable fidelity. Like Google, Apple has its own drift-correction tech at play to stop objects from moving from their spot (a problem I've experienced with a lot of AR before), no matter whether I moved the iPad left to right or even flipped it into landscape. Everything remained fixed as if it were really there on the table, waiting for someone to pick it up. What's more, when I turned on the lamp I could see the shadow effects working, and they moved and molded as I moved the lamp around the room, much better than I expected. Of course, how well all of this will work when you start dropping more busy objects in remains to be seen, but Peter Jackson's studio Wingnut AR showed off a much more intense demo on stage that was built with the Unreal Engine. We also know that all of this will make Pokémon Go look more lifelike. So there's that. Here's the thing though: Apple doesn't need to make AR glasses yet. Hell, that would be kinda dumb right now. What Apple is doing is trying to establish itself as the dominant force in AR, and to that end, it's building a platform first. While Tango, its obvious competitor, remains limited to handsets, ARKit will work across the entire iOS ecosystem. Apple's Craig Federighi said himself at WWDC: Apple is building "the largest AR platform in the world". Much of Apple's success lies in its thriving App Store, and for AR to take off in the consumer space it's going to need interesting, fun, repeatable applications. Which is exactly what developers can start building now that Apple is providing the toolkit. By the time that next Pokémon Go comes around, Apple will be ready for it. Heck, it may even be the one to own it. And then, yes, glasses. Whether or not you believe rumours that Apple's AR glasses project is on the ropes, it seems inevitable that this technology will be moving to our faces, Apple or no Apple – so I expect it will find a way to get there. And when it does, it will already have the platform, the games, the experiences – maybe that "killer app" – ready to go. From what I saw at WWDC, Apple is set for a great start. The tools are there and they look good. Really good. But it will come down to the developers to make all of this work, because no matter how good Apple can make a vase look, it's not the thing that's going to sell people on AR. Tim Cook has claimed AR will be "as big as the iPhone". I think he's wrong; I think it will be so big that it eventually kills the iPhone. Probably not in five years, maybe in ten. Whenever it happens, remember that today was the day the countdown started. AR you looking for more to read?